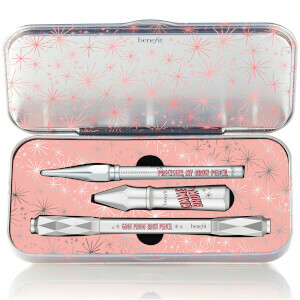 Combining three mini treats for the face, brows and lashes, the benefit You're a Lucky Star! Gift Set arrives in pig-shaped moneybox to celebrate Chinese New Year. Enhance your pout and cheekbones with the rose-tinted stain, developed to transform into a sheer, transparent colour that is ideal for all complexions. Loved by celebrities and makeup artists alike, Benetint melts onto skin and allows effortless blending for a radiant pop of colour. Instantly addressing gaps in your brows with a soft and natural finish, the waterproof pencil features a custom, non-sharpen 'goof proof' tip and a buildable formula that glides effortlessly through the brows, defining, filling and enhancing to help shape and contour your face. Expect beautifully defined brows with a natural finish. Lasts up to 12 hours. Equipped with a 'Hook 'n' Roll' brush, the lifting mascara expertly grabs, separates and lifts lashes, coating them in a curling formula that holds for 12 hours. Formulated with conditioning Provitamin B5 and Serin, the mascara delivers ultimate curl and lift while nurturing and nourishing lashes. Expect longer-looking, curvier lashes. Eyes appear wide awake and energised. Easy to remove. 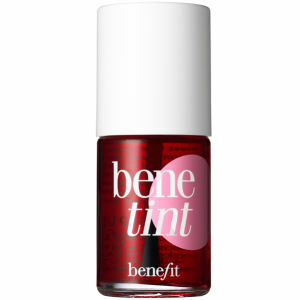 Benetint: Twist off cap and dot onto cheeks and blend with fingertips, then glide onto lips. Repeat for a deeper pop of colour. For a sweet popsicle style pout, apply stain from the centre of lips blending outward. Brow Pencil: Glide eyebrow pencil along brow to fill and shape, using a couple of strokes to build colour. Blend with a spoolie brush for soft, natural-looking brows. Mascara: Gently wiggle the wand from base of lashes to tip. Repeat across your lashline, making sure to catch every lash. Benetint: Water (Aqua), Polysorbate 20, Phenoxyethanol, Sodium Hydroxide, Carmine (Ci 75470), Methylparaben, Fragrance (Parfum), Tetrasodium Edta, Geraniol, Linalool, Hexyl Cinnamal, Citronellol, Maltodextrin, Benzyl Salicylate, Bht. N° 00n12802. Brow Pencil: Synthetic Fluorphlogopite, Stearic Acid, Hydrogenated Castor Oil, Synthetic Japan Wax, Ethylhexyl Palmitate, Cera Alba (Beeswax), Sorbitan Sesquiisostearate, Aluminum Hydroxide, Tocopherol. [+/-: Ci 19140 (Yellow 5, Yellow 5 Lake), Ci 42090 (Blue 1 Lake), Ci 77007 (Ultramarines), Ci 77163 (Bismuth Oxychloride), Ci 77288 (Chromium Oxide Greens), Ci 77289 (Chromium Hydroxide Green), Ci 77491, Ci 77492, Ci 77499 (Iron Oxides), Ci 77510 (Ferric Ferrocyanide, Ferric Ammonium Ferrocyanide), Ci 77742 (Manganese Violet), Ci 77891 (Titanium Dioxide)]. N° 09825/A. Mascara: Aqua (Water), Paraffin, Cera Alba (Beeswax), Polybutene, Bis-Diglyceryl Polyacyladipate-2, Palmitic Acid, Stearic Acid, Triethanolamine, VP/Eicosene Copolymer, Acacia Senegal Gum, Copernicia Cerifera (Carnauba) Wax, Euphorbia Cerifera (Candelilla) Wax, Hydroxyethylcellulose, Silica, Phenoxyethanol, Panthenol, Butylene Glycol, Caprylyl Glycol, Tocopheryl Acetate, Algin, Serine, BHT. [+/-: CI 19140 (Yellow 5, Yellow 5 Lake), CI 42090 (Blue 1 Lake), CI 77007 (Ultramarines), CI 77163 (Bismuth Oxychloride), CI 77288 (Chromium Oxide Greens), CI 77289 (Chromium Hydroxide Green), CI 77491, CI 77492, CI 77499 (Iron Oxides), CI 77510 (Ferric Ferrocyanide, Ferric Ammonium Ferrocyanide), CI 77742 (Manganese Violet), CI 77891 (Titanium Dioxide)].